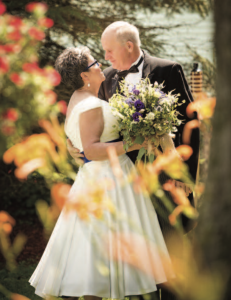 An idyllic wedding, a bride and groom in their 60s, and adventure in the offing. It’s hard to imagine a more joyful and love-filled celebration than Norm and Donna’s 2017 marriage. In a summer full of rainy weekends, July 22 dawned sunny and bright, promising an ideal wedding day at their farm in Cardinal, Ontario. Donna was the apple of Norm’s eye, though. When he saw her in all her wedding finery, he cried.“It was such a touching, vulnerable moment for both of us,” she recalls. What’s also captivating about that moment is it can be traced back to an Internet dating site. The guy was smitten. After their second date, Norm suggested they get married. Donna was firm about taking things more slowly, telling him she wouldn’t make any promises for at least six months. “Almost six months to the day of our first meeting, in late August 2016 at nine in the morning, he proposed to me.” On the side lawn at the farm, where they liked to sit and chat about their day, he got down and asked for her hand in marriage, presenting her with a beautiful Vera Wang ring. When they told their families the good news, Noranda reprised her cupid role, offering to plan the nuptials. 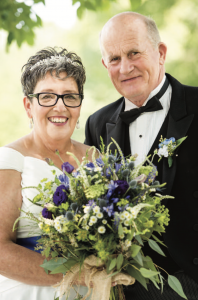 Lists, timelines — based on hay-cutting season, invitations — music, refreshments, a farm spruce-up, parking and more, came together without a fuss because everybody pitched in to make this love connection permanent. For instance, Norm’s sister Grace, a talented seamstress, transformed the floor-length gown Donna bought in Napanee into her dream dress, complete with a gorgeous blue petticoat that would peek out from under and twirl as she danced. Then unexpectedly, the day before the wedding, friends arrived with containers full of flowers, cut from their flower gardens, to put around the property. Not only did Norm’s lead hand, Dustin, build the bar for the dance hall, on the day of the wedding Dustin’s wife, Hayley, drove the tractor — in her heels and dress — that pulled the trolley transporting guests from their cars to the ceremony. 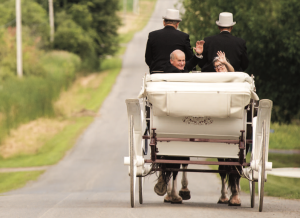 Both Donna and Norm were delighted that their pastor, Bernie Bakker from Community Christian Reformed Church, agreed to conduct their outdoor service, and when the bride, her three sisters and her niece arrived, it was by a horse-drawn carriage driven by another good friend and his son.